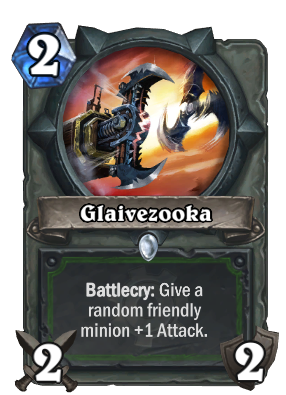 With the Fiery War Axe nerf in full swing, is Glaivezooka now the best weapon in the game? Jade Claws is the best one in my opinion. Could enable pirate hunter in Wild, notice the three classes that are running Patches and Small-Time Buccaneer all have turn 2 weapon plays. This card will depend entirely on the meta. Good if 2 health minions become popular, garbage otherwise. Turn 1, Undertaker Coin Webspinner, turn 2 Glaivezooka makes the Webspinner 2/1 and you hit face for 6 or maybe using one of the many options to kill whatever minion(s) you just played while still hitting for 2-4 in the face on the second turn. I think Eaglehorn possibly does make this a little redundant, but hell - Hunter has always had a glut of 3-mana choices and not enough 2-mana choices, and I think this bears some consideration. Besides, you can still attack with it on turns 2 and 3 and then play Eaglehorn Bow. And being common, this immediately becomes a fantastic pick in the Arena for Hunter. Anyway, I think this card will ultimately see a fair amount of play, actually - unlike Warrior/Shaman, Hunter has never had a 2-mana weapon before. And even with Eaglehorn making this somewhat redundant... This is a really good card in, in a vacuum, and that means something. It can create massive card/tempo advantage, in my eyes. I dont think its that bad though. Nice to have a second weapon choice.